Summer has arrived in Bozeman, MT. The sun is out, bugs are hatching, trout are rising, and all of our local rivers and creeks are fishing well. Expect great fly fishing any which way you drive from Bozeman. The Madison River and Yellowstone River is where you can find most of our Montana fly fishing guides and anglers, but the Missouri River has been a dry fly anglers paradise and will continue to be so in the coming weeks. Head to Yellowstone National Park to stay on the salmonfly hatch and enjoy some of the best wade fishing around. Grab your rod, a few of your favorite flies, and hit the road or give us a call to experience some of the best fly fishing of the year. Summertime and the living is easy in Bozeman, MT. Fishing on the Yellowstone River has been nothing short of great for the past week and will only continue to improve in the coming weeks as flows continue to drop. The salmonflies have moved on but the golden stones are flying around from Gardiner down through Livingston, as well as daily hatches of caddisflies, little yellow sallies, and flying ants. Plenty of bugs to keep the fish looking up. We’ve had a bit of a heat wave the past week which has meant the morning bite has been better than the afternoons, but look for this to change as the fish adjust to lower flows and summer weather. Dry fly, dry-dropper rigs, nymphing, and streamers can all get it done. Hoppers are starting to buzz in the bushes, look to see them on the water soon. The new Sage Lodge has opened for the summer season. Check them out on the web at www.sagelodge.com/ for the newest lodging around for anglers. What a year it has been so far on the Madison River. Hebgen dam is fixed, our guides and anglers were treated to an excellent salmonfly hatch, and continue to have great fishing daily as the summer hacthes progress on. The river has been littered in PMDs, caddisflies, little yellow sallies, and green drakes. All you can eat buffet for wild trout. We like early starts and late evenings on brighter days for the best dry fly fishing, but nymphing has remained steady all day long. Prince nymphs, PTs, stonefly nymphs, hare’s ears, and of course worms can all get it done subsurface. Look for ants and hoppers to enter the dry fly equation soon. If the river runs cold through August, 2018 on the Madison River will be one for the books. 6000 CFS, water temps in the mid-60s, plenty of bugs hatching daily, and lots of happy fishermen. The trico hatch has begun and will only continue to improve in the coming weeks. PMDs, caddisflies, and smaller terresterials are around to round out the dry fly fare. Nymphing remains great. Expect good fishing from the Dam all the way down to Cascade. Fish the middle, to the bank, on the seams, in the swirlys, or strictly on top. No bad way to go right now. Hard to beat summertime on the Paradise Valley Spring Creeks. The PMD hatch has begun to fade, but tricos, caddis, midges, and terrestrials in good enough numbers to keep the dry fly action going. Great time of year to spot and stalk big single fish. Walk slow, keep your eyes peeled for subtle takes, and make your first cast count. Head to the faster water for nymphing success. Midges, sows, scuds, and mayfly nymphs are all winners. Head out early to catch the spinner fall. Salmonfly mania goes on! The big bugs have moved out of the floatable stretches of rivers in Bozeman, MT but continue to fly around in full force in Yellowstone Park. Strong hikers can head into the black canyon of the Yellowstone River to hit the hatch. 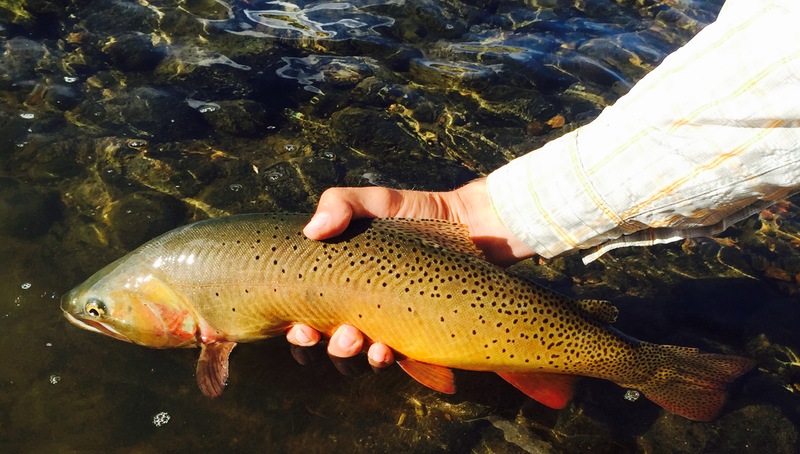 The Lamar River is quickly coming into shape and anglers can expect to find great hatches of golden stones, green drakes, and little yellow sallies. Terrestrials soon to come. Soda Butte, slough creek, and the many other tributaries of the Lamar and Yellowstone River are all great options now. Just don’t forget to leave your felt soles at home in 2018.